You are currently browsing the category archive for the ‘history and current events’ category. First of all, let nobody say Christopher Nolan lacks a sense of humor: for the second time, he’s kept Tom Hardy under a voice-distorting face mask for almost an entire movie. I am morally certain that Nolan understands this as a wink to the audience as well as a challenge to Hardy; the director likes a little reference, even if, say, it’s an incongruous one to nineteenth-century British literature. Which is why I’m also morally certain that if you think Nolan’s Dunkirk does not include the larger narrative of British history, you’re missing the point of the movie. While I admire Drezner’s forthrightness in admitting a mistake I think he has made another one. He should make only the first half of this apology, because, in fact, the context is not clear—as, I can only suspect, is indicated by Sessions’s decision not to say the word aloud. Below the fold you will find what I had to say about the election before the election. This excerpt comes from a paper I wrote for a conference about the Obama presidency; the papers were due October 28. In the New York Times story about the conference, you will read that “the overwhelmingly liberal group” were, in the main, blindsided by Trump’s victory, shouting “Get me rewrite!” As you will see, I wasn’t one of those, and I generally stick by what I had to say, though it is, as a draft, a little rough. Watch out, Peter. David Brooks wants to rob you to pay Paul. Welfare spending [is] 10 times greater than in the dark depths of the Depression. We’re spending 45 billion dollars on welfare. Now do a little arithmetic, and you’ll find that if we divided the 45 billion dollars up equally among those 9 million poor families, we’d be able to give each family 4,600 dollars a year. And this added to their present income should eliminate poverty. Brooks is claiming that federal spending on anti-poverty programs is not lifting families out of poverty… when the government specifically does not include the value of those very programs in its poverty calculations.… A fuller accounting shows that food stamps alone lift 4 million people above the poverty line. The earned-income tax credit lifts nearly 6 million above it. Which is to say that “not bringing down the official poverty rate” is not a good yardstick by which to judge these programs. But I would like to take David Brooks up on his suggestion: with the absolute same degree of sincerity as 1964-era Reagan, he’s supporting a straight-up transfer of wealth from the rich to the poor. It is a radical solution to poverty, this long-standing Republican proposal, but perhaps one that we should consider. With Abenesia in the news, I thought it might be useful to talk about another Axis nation’s complicated struggle with the memory of the Second World War. Jennifer Teege found out, at the age of 38, that not only was her grandfather a Nazi, he was an especially infamous Nazi: Amon Goeth, the commandant of Płaszów concentration camp, the man played by Ralph Fiennes in Schindler’s List. On trial after the war, Goeth sneered at the witnesses against him, “What? So many Jews? And we were always told there’d be none left.” He gave a Hitler salute on the gallows. Hence the title of Teege’s memoir: she has an African father, and a Nazi grandfather who would have regarded as subhuman a person of African descent. The book is a great deal subtler than the title suggests. It is saturated in memory, and forgetting, and the fault lines between memory and history run throughout it. Teege describes her attempt to reconcile what she learns about her grandfather with the kind – but, she now knows, complicit – grandmother she remembers. The book presents Teege’s reminiscence and necessarily somewhat therapeutic work alongside the sober, reportorial voice of Nikola Sellmair, whose dry factual rendering of verifiable history often undermines Teege’s hopeful, emotional writing. There are different kinds of memory in the book. Teege’s adoptive German family had a more usual relationship to the Nazi era – her father didn’t really know the extent to which his family had taken part in Nazi crimes. Sellmair discusses such modern Germans, summarizing Harald Welzer’s study “Grandpa Wasn’t a Nazi.” Latter day Germans seize on any opportunity to construct a guiltless, even noble past for their forebears – as with the French, they were all in the resistance. Teege’s brief narrative also encompasses also the memory kept by Holocaust survivors and their descendants: before Teege found out about her grandfather, she traveled to Tel Aviv, made friends there, and lived there. Her discovery imposes silence between her and her Jewish friends. She doesn’t know what she can say. Her grandfather might have shot their grandparents. “There is no Nazi gene,” Teege insists, struggling against the idea that she must bear some guilt for her grandfather. But she clearly feels that guilt. We all inhabit the world the bloodthirstiest conquerors made; only some of us grew up with them, personally. 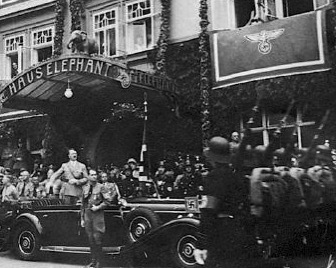 Franklin Roosevelt recognized the threat Adolf Hitler posed from the moment of the German Chancellor’s appointment. In January of 1933, Roosevelt—not yet inaugurated, though already elected, President—told an aide that Hitler’s ascent was “a portent of evil”, not just for Europe but “for the United States”. He “would in the end challenge us because his black sorcery appealed to the worst in men; it supported their hates and ridiculed their tolerances; and it could not exist permanently in the same world with a system whose reliance on reason and justice was fundamental:. From then onward, Roosevelt’s policies raced Hitler’s: the New Deal was not merely a programme for recovery from depression, but one to rebuild economic strength while preserving democracy in the United States so the nation would be ready to fight Nazism when the time came. The New Deal gave Americans not only the material capacity to fight fascism, but faith in American institutions. Which is why, of course, the prevalence of remarks like this one remains so appalling. If you’re interested, Slate just posted an excerpt from a chapter — on Appomattox and memory — from Battle Lines, the graphic history of the Civil War I’ve written with Jonathan Fetter-Vorm. Perhaps my favorite story of the Civil War comes from Lee’s surrender to Grant at Appomattox, which took place 150 years ago today. Here’s an excerpt, below the fold, from a piece I wrote last year about that episode.